It was in 1156 that Maharawal Jaisal Singh Ji , abandoned his old capital at Lodhurva to establish a new citadel on "Trikuta Hill" . In doing so he fulfilled an ancient prophecy that Lord Krishna predicted and said to Arjuna , when the Pandavs were in exile that my descendants would one day establish their capital here . "Maharawal Brijraj Singh ji" 43rd ruler of Jaisalmer has converted Jawahar Niwas Palace, this marvel into a beautiful heritage hotel .Today it has open its gates and welcomes you to be a part of this legacy which has been seen & enjoyed by many dignitaries like , the Royalties , British Viceroys , the First President and Prime Minister of India and very well renowned artists , actors like M.F. Hussain , Amitabh Bacchan , Brad Pitt and Angelina Jolie, have also visited and stayed to experience and enjoy the Royal splendors and comforts of the Palace. Parking, Room Service, Airport Transportation, Breakfast Services, Laundry Facilities, Doctor on Call, Travel Counter, Backup Generator, Currency Exchange, Security Guard. Air Conditioning Room, Attached Bathroom, H/C Water, Iron/Ironing Board, , Toothbrush/Razor on , DVD Player, House Keeping, Cable/Satellite TV. 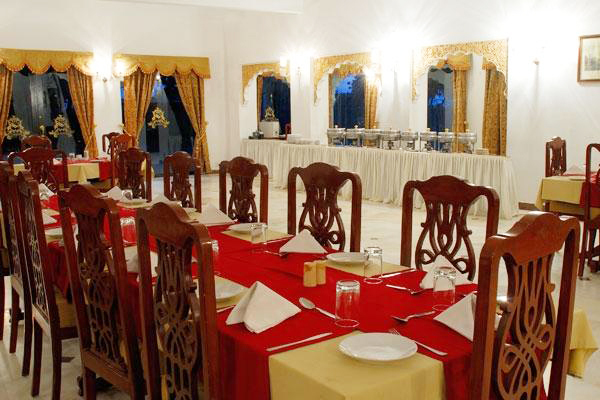 User reviews for "Jawahar Niwas Palace Hotel Jaisalmer"